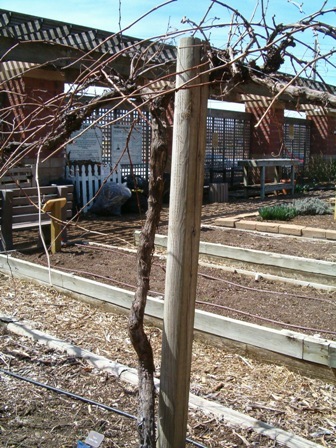 The vines grew quite aggressively last year, so there was a lot to prune. 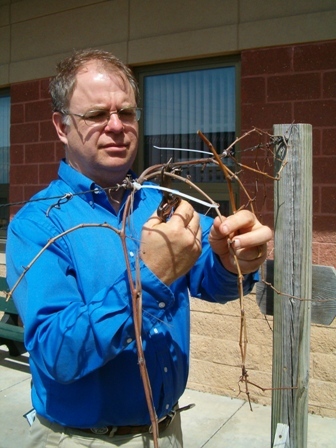 Pruning grapes can be a little scary, even for me, so I had Bob, our other Hort Agent, come help with the pruning. Bob went right to town on those grapes. 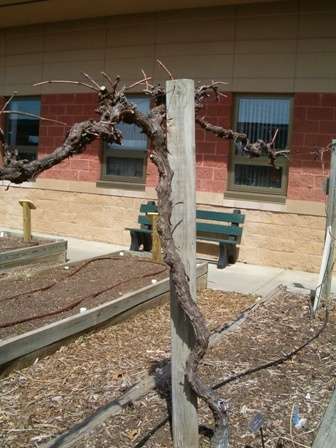 First we worked on training the young vine. Then “snip, snip, snip!” He really made quick work of the rest of the vines. Can you see the difference? The vines look positively bare at this point. Bob pruned almost all the growth from last year off, leaving little shoots with 1 bud for regrowth of vegetative vines and slightly bigger shoots with 3 buds for fruiting vines. Workshop Handouts & a Giveaway! Welcome to The Demo Garden Blog to all of you who attended the Get Growing Vegetables workshop this morning! I hope you learned a lot. There are 2 ways to enter, and you can enter a maximum of 2 times (one time each way)! You must use a real email address, otherwise I won’t be able to contact you. 1. Post a comment below, telling one thing you are planting in your garden this year. 2. Post a comment below, giving ideas for topics that you would like to see offered at future gardening workshops. If you want to see what plants you might win, you can check out our seed starting list here. Entry Deadline is Tuesday, March 30th at 5 pm. Winners will be announced Wednesday morning. UPDATE: Congratulations to Mart and Audra, the winners of the pepper and tomato plants! We have 2 different types of raspberries in the Demo Garden: ‘Caroline,’ a fall-bearing red raspberry, and a mystery variety of a summer-bearing black raspberry. After last year, I have totally fallen in love with ‘Caroline.‘ The black raspberry though…I have a feeling that its life is coming to an end in our garden. It’s going to have to do significantly better than 4 small berries this summer to prove its worth! The thicket that is the black raspberries. Yikes! Definitely some work to do here. 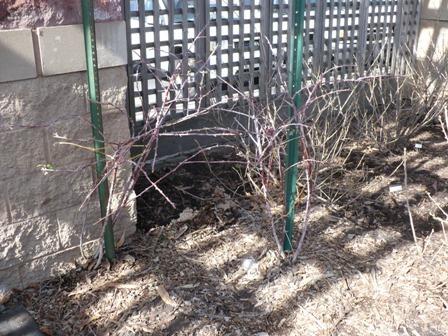 There were rooted branches all the way back to the lattice wall behind the currant bushes. Ugh. The red raspberries are also a bit of a jungle, but not quite so bad, since the canes are primarily upright. I love pruning the fall bearing raspberries! 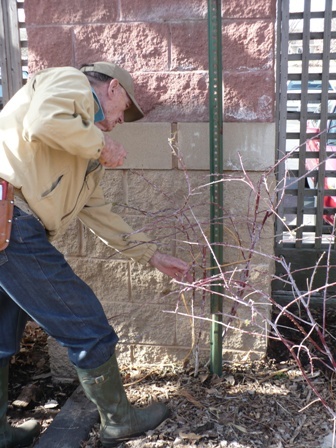 All you have to do is prune them back to the ground, and the job is done! So easy. So simple. Minimal scratches on the arms. 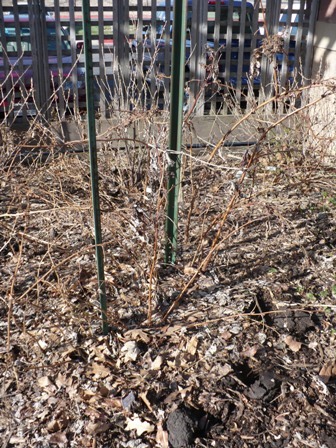 These nasty black raspberries, on the other hand…First we pruned out all the dead canes. Then we pruned back all the branches and side shoots that were longer than 3-4 feet. 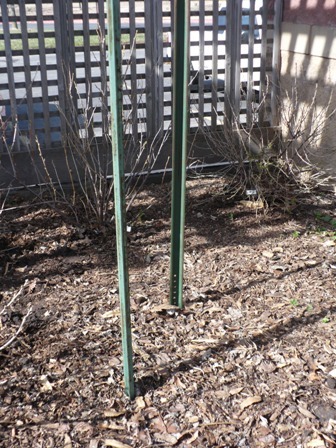 Next we pruned out all but the 3 or 4 strongest canes in each of the two clumps. Finally, we tied the canes up so they can’t reach the ground and root again! There. They look much better. 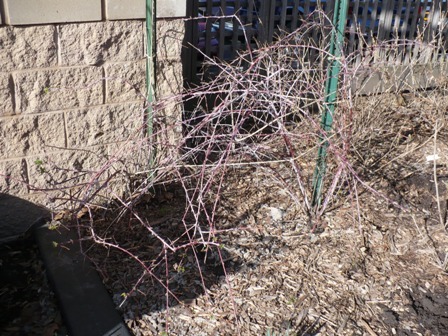 Less like a crazy, dangerous thicket, and more like well-behaved raspberry bushes. Right. File this away in the “so now we know” category. Also in the, “grr…now there’s another section of the garden to be wary of” category. GRR! 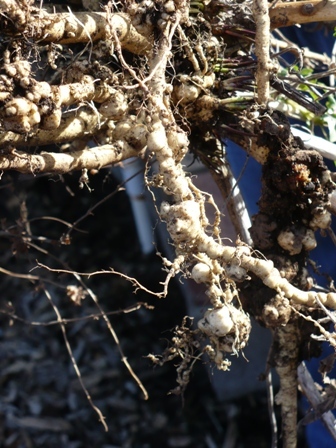 That is a very nasty look at the roots of the poor marshmallow plant. It had been rather yellow and wilty for a large part of last summer for no apparent reason. Well…now we know why! It is absolutely infested with root knot nematodes. Into the dumpster with the plant. Something else to watch for in that garden now.